An "irresponsible" direct email ad from Ladbrokes has been banned by the ads watchdog for featuring a picture of a footballer aged under 25. The ad featured the Manchester United footballer, Memphis Depay, who is 21 years old. According to the CAP advertising code, images of people aged under 25 (or who appear to be) may not be used in marketing communications involving bookmakers. However, sportspeople under 25 years old may appear if the bet can be placed through a transactional facility, such as the gambling operator’s own website, or as used to illustrate specific betting selection where they are the subject of the bet. When contacted by the Advertising Standards Authority, Ladbrokes admitted they had been at fault and said they have reminded their marketing team about their obligations under the CAP code. In its ruling published this morning, the ASA described the ad as "irresponsible". The ad must not appear again in its current form. It comes a week after the ASA itself lodged complaints against a trio of bookmakers for tweeting betting ads about the American golfer, Jorden Spieth, who is 22 years old. 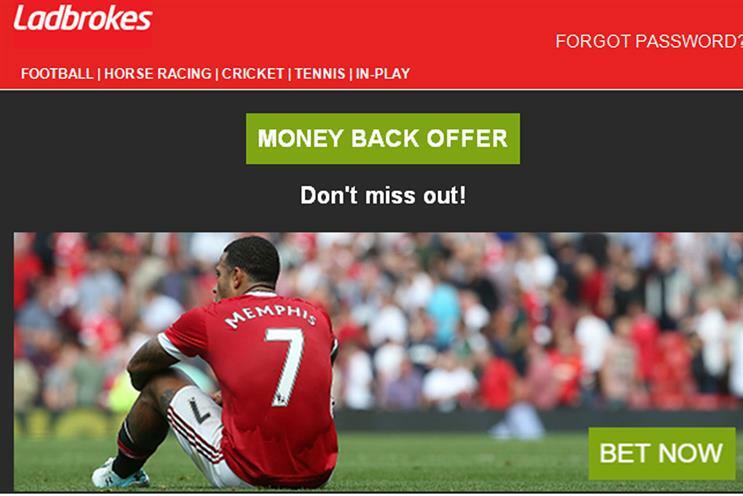 Bet365, Coral and Totesport were informed by the ASA that the Twitter ads must not appear again.